If you are looking to achieve a modern landscape design at your home or business, Southern Landscape Supply can help. We offer Summer Sod and gravels that are critical components of modern landscape design. Modern design incorporates plants that require little watering and maintenance. Succulents and palm trees are often used. These types of plants are often planted among gravel areas. The look of a hardscape creates the design of modern design. Pavers used for modern design can also be nestled among gravel to help offer a mix of hardscapes. Gravel also helps keep pavers in their place. While modern design usually is marked by low maintenance and watering, splashes of well-planned and confined grasses are also effective. You may consider adding small green spaces shaped with modern and sleek lines. You can confine the sod to spaces or you can use sod to surround pavers or other modern elements of your design. 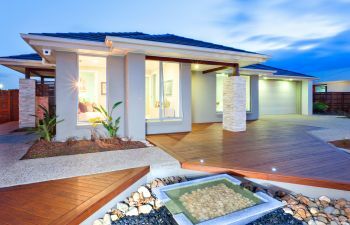 There are other common modern components of landscaping are important in order to achieve the look. Contact Southern Landscape Supply to help beautify your residential property. We are a family owned and operated business that strives to be the best landscape company in the metro Atlanta area. Our love of landscaping drives our passion for excellent customer service and for researching and educating ourselves on the most up-to-date products available for your design needs.